11 November 2011, 00:12 a.m.
It’s finally official – at least for those who are aware of how the web works. Yesterday Adobe announced that they will be discontinuing flashWeb-based multimedia platform. Used for putting animation, interactivity, and video on web pages. support for mobile devices. To be sure they did plenty of backpedaling about renewed focus and new features for the desktop, but make no mistake, they see the light at the end of the tunnel, and they finally figured out it’s a train. Hello HTML5HTML5 is the most recent version of the HTML standard. It is a language used to create web pages. Currently it is a draft standard, but it supported by all major browsers. HTML4 is the current actual standard. Express! As I’ve said before this is a fine thing. The truth is that many years ago Adobe was the only way to do animation, video, and interactivity at all. And after that, it was just the best way. And after that, the most common way. Three things really killed them. I’ll take them in reverse order, since the third was just a symptom, but most think it was the cause. Namely, Steve Jobs. At Apple, Jobs figured out that FlashWeb-based multimedia platform. Used for putting animation, interactivity, and video on web pages. not only doesn’t work well for mobile, but it probably wasn’t every going to, at least not before HTML5HTML5 is the most recent version of the HTML standard. It is a language used to create web pages. Currently it is a draft standard, but it supported by all major browsers. HTML4 is the current actual standard. would catch on. But Jobs didn’t kill FlashWeb-based multimedia platform. Used for putting animation, interactivity, and video on web pages., he was just more vocal about it’s shortcomings. Number one was that the need for FlashWeb-based multimedia platform. Used for putting animation, interactivity, and video on web pages. simply isn’t there the way it once was. Web pages used to be really static. In the beginning there were almost completely text. Then people started adding more images. Then came databases and data-driven apps. Then video, sound, and fully interactive applications. But before the last, there was a gap, people wanted video and apps, but it just wasn’t easy. Most applications consisted of some special code that had to be downloaded on your machine, and were essentially client-server programs that used the web simply as a transport mechanism. FlashWeb-based multimedia platform. Used for putting animation, interactivity, and video on web pages. is pretty much the same as the others, with the exception that it was pretty easy to use, and it managed to catch on. With critical mass, it started to be supported by most browsers, and off it went. Today we can get streaming video quite easily without FlashWeb-based multimedia platform. Used for putting animation, interactivity, and video on web pages.. Any web site that doesn’t provide video feeds in HTML5HTML5 is the most recent version of the HTML standard. It is a language used to create web pages. Currently it is a draft standard, but it supported by all major browsers. HTML4 is the current actual standard. simply cuts of millions of potential users, which is generally a poor business decision. As for apps, the simple web applications that are in FlashWeb-based multimedia platform. Used for putting animation, interactivity, and video on web pages. will continue to live on, but the great desire for them has changed. Now users can download free and inexpensive games all day long on their mobile devices, which is where they normally play the little time wasters. (I’m not judging, I do it myself.) So why do you need FlashWeb-based multimedia platform. Used for putting animation, interactivity, and video on web pages.? I’ve always said that the value Adobe brings to the table isn’t so much FlashWeb-based multimedia platform. Used for putting animation, interactivity, and video on web pages. itself as the amazing tools they provide for web development. The designer shouldn’t have to care so much about whether the application is FlashWeb-based multimedia platform. Used for putting animation, interactivity, and video on web pages. or HTML5HTML5 is the most recent version of the HTML standard. It is a language used to create web pages. Currently it is a draft standard, but it supported by all major browsers. HTML4 is the current actual standard., they should be able to just code. Adobe should be able to quickly get in front of this by providing everything FlashWeb-based multimedia platform. Used for putting animation, interactivity, and video on web pages. does in HTML5HTML5 is the most recent version of the HTML standard. It is a language used to create web pages. Currently it is a draft standard, but it supported by all major browsers. HTML4 is the current actual standard.. And to do that, they had to finally admit that HTML5HTML5 is the most recent version of the HTML standard. It is a language used to create web pages. Currently it is a draft standard, but it supported by all major browsers. HTML4 is the current actual standard. is killing FlashWeb-based multimedia platform. Used for putting animation, interactivity, and video on web pages.. Mobile is just the first step. As for reason number 2 (for those who’ve been keeping track… 3,1,2) it explains why mobile is the first step. And that reason is that FlashWeb-based multimedia platform. Used for putting animation, interactivity, and video on web pages. is ill-suited for mobile for various reasons. One is performance. It’s easy to see that FlashWeb-based multimedia platform. Used for putting animation, interactivity, and video on web pages. is a hog no matter what the platform. Try a simple test – fully charge the battery on your laptop. Fully disable FlashWeb-based multimedia platform. Used for putting animation, interactivity, and video on web pages. and spend a couple of hours surfing the web. Then charge the batter again, turn FlashWeb-based multimedia platform. Used for putting animation, interactivity, and video on web pages. back on, and repeat. You’ll be shocked at the results. Bear in mind, I’m not talking about playing FlashWeb-based multimedia platform. Used for putting animation, interactivity, and video on web pages. games and video even, just surf the web. Not only do you avoid advertising, but you’re battery lasts longer and everything runs faster. Who would have that that dumping FlashWeb-based multimedia platform. Used for putting animation, interactivity, and video on web pages. was a way of going green? But it is. Now imaging trying the same thing on a device with a tiny battery, slower processorThe CPU or Central Processing Unit is the key brain of the computer, it's the part where most computation is actually done. and a lot less memory. Painful. The other part of the equation is the usage paradigm. Early in the iPhone era people started writing articles about how to program an iPhone. Many articles described handling the touch interface exactly the way you would a mouse. This is of course ridiculous, especially now with multi-touch and gesture. Even without that, a finger simply doesn’t behave the way a mouse does. For instance, you can pick a finger up and put it down somewhere and the cursor moves with it. If you pick up a mouse and set it down the cursor is either where you started or in some random place – not the most useful feature. The touch interface is just one aspect of mobile programming that makes FlashWeb-based multimedia platform. Used for putting animation, interactivity, and video on web pages. painful on a mobile device. Silly things like x controls that let you close a FlashWeb-based multimedia platform. Used for putting animation, interactivity, and video on web pages. animation are frequently too small to be used. Add that all up and you find that the basicBeginners All Purpose Symbolic Instruction Code. A programming language designed specifically for beginners. concept of FlashWeb-based multimedia platform. Used for putting animation, interactivity, and video on web pages. is flawed, namely to be a “write-once run-anywhere” works fine on the desktop, but doesn’t translate well to the mobile touch-enabled world. Which leads us back to Steve Jobs, 1-2-3. But to continue to support an already dead platform on a dying tablet is like throwing salt in the wound of an already squashed slug. So when HTML5HTML5 is the most recent version of the HTML standard. It is a language used to create web pages. Currently it is a draft standard, but it supported by all major browsers. HTML4 is the current actual standard. gets better and your mobile device gets stronger, you can thank Adobe for finally recognizing the inevitable – FlashWeb-based multimedia platform. Used for putting animation, interactivity, and video on web pages. is dead. 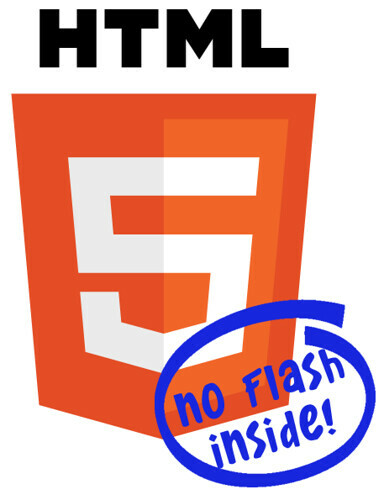 That Bright Light You Saw was the End of Flash originally appeared on The Code Curmudgeon on November 10, 2011. Dedicated to blogging (ranting) about software processes, trends, security, and general tech industry.